I've always like the basic aesthetic of the American Craftsman design movement, an extension of the British Arts and Crafts style. Visionaries like William Morris and Gustav Stickley crafted simple and straightforward textiles and furnishings in reaction to the industrialization and ornate design of the Victorian era. Drawing from natural materials and the green and brown shades of the outdoors, Craftsman designs employ centuries-old wood jointing methods, including dovetailing, pegs and dowels in place of nails and screws. More than a century after Stickley and his brothers entered the furniture business, the enduring popularity of his designs keep a factory in upstate New York busy filling customer orders. 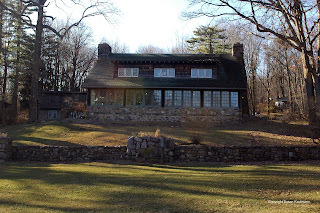 Until a few years ago, though, I had no idea there's a New Jersey connection to the Craftsman movement just off Route 10 in Parsippany. The Stickley Museum at Craftsman Farms not only preserves Gustav's work, it represents one of his lesser-known concepts: a self-sufficient farm school for young men. Ivan and I visited the museum recently to learn more about the man, his vision and how he came to choose New Jersey as the location for what he called his Garden of Eden. Once you're off the highway and past the entrance to a townhouse development, you feel as if you've been transported to the countryside. For me, it brought back memories of arriving at Girl Scout camp in Sussex County. You get the feeling that the lodge was designed to be a gathering place as much as it was to be a home, but something about it felt a bit backwards, as if we were coming in the wrong way. As it turned out, that feeling was spot on, and we'd approached the property from behind, not as Stickley had intended. The lodge is situated atop a hill, its front porch overlooking a clearing that slopes gently downward to a wooded area. A carriage path meanders up from below, intended to bring guests from the Erie Lackawanna railroad tracks hidden at the property line at the base of the hill. Stickley himself would flag down a passing train for his commute into New York City. It's not surprising that the rustic lodge blends so neatly into its surroundings: the chestnut wood and stone it's constructed from were all gathered from the property, consistent with the Craftsman aesthetic. A walk through the first floor of the home reveals a spacious enclosed porch, a sizeable living room that would probably be called a great room in today's McMansions, and an expansive dining room. Furnished with authentic Craftsman furniture and clad with natural wood grain lovingly restored to Stickley's original intent, the rooms are somewhat dark but extremely inviting. One can imagine many cozy winter evenings by the fireplace, as well as many comfortable summer days with cooling breezes flowing through the many windows. By contrast, the whitewashed kitchen is both bright and large enough to produce a meal big enough for an army. And, in fact, that's what it was designed for, kind of. Stickley wanted to build a farm school for boys, an agricultural community that would include cows, chickens, an orchard and a vegetable farm. Encouraged by Homer Davenport, a political cartoonist who lived nearby in Morris Plains, Stickley bought 650 acres of property there in 1908 and proceeded to build and design his own natural utopia, including a home for his family. Only thing was, not many other people took to the concept. With no students, he was left with the lodge, three cottages, stables and other farm buildings. He changed his plans and made the lodge into his family home, maintaining the farm to supply food to the restaurant in his Craftsman Building on Fifth Avenue in New York. Stickley's impact on the property is lasting, but his own presence there was short. Business troubles forced the sale of the farm to the Farny family in 1917, and while they largely made only cosmetic changes to the lodge, they sold off much of the farm, leaving just 30 acres intact. As with so many other culturally-important places, the growing popularity of the area made the broad expanse of land very attractive for other uses. In fact, it was the encroachment of potential development that led to the preservation and restoration of Craftsman Farms, the sale of the property to the town of Parsippany-Troy Hills, and the creation of the Craftsman Farms Foundation that manages and preserves the lodge for future generations. The grounds are now a township park that's open seven days, and the Stickley Museum is open for tours on weekends during the winter and from Wednesday to Sunday the rest of the year. (Check out their website for more precise dates and times.) While there are no farm animals on the property, the park also hosts a wide range of events and activities that everyone in the family can enjoy. There's so much more to the story, as we learned from the very knowledgeable docent who conducted our tour. Whether it's the restoration of the house, how various pieces in the collection were acquired, or stories about Stickley, his family or the Farnys, we clearly could have stayed another few hours to learn all there is to know about Craftsman Farms. Stop by and check it out -- you're sure to find something that piques your interest! Many thanks to Foundation trustee Lynn Leeb for arranging and hosting our visit!